NVIDIA Home > Support Home Page > Knowledgebase Home Page > How do I capture the EDID of my display? Quadro and NVS boards have an EDID management system integrated into the driver, accessible through the system topology viewer. 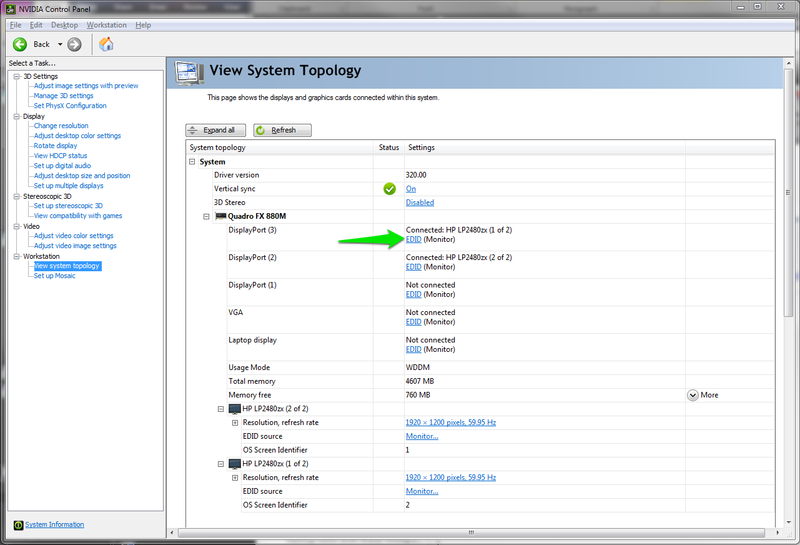 To capture the EDID, open the NVIDIA Control Panel and select View System Topology. 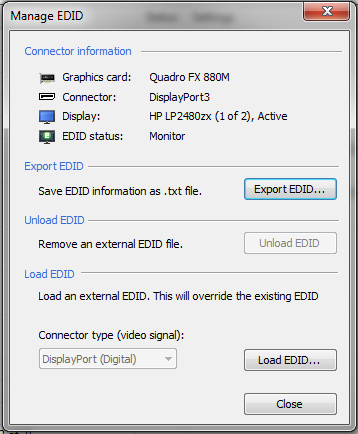 To export the EDID, find the display, then click the EDID link under it. In the EDID management dialog, select Export EDID, and save the EDID. EDIDs are saved as text files. Once you have downloaded Monitor Asset Manager, proceed to install the software. Then open Monitor Asset Manager. On the top left-hand box, look for the display model(s) that are labeled "[Registry-Active]". These are the currently active displays. Select the display for which you wish to read the EDID data. On the right window, you will see the EDID information for your display. If you are asked to provide your display's EDID, copy the text on the right side and paste this into the format you intend to provide this information. Please note: If you have Microsoft's UAC enabled (Windows Vista or later), you will need to be logged in with Administrator rights to export your monitor's EDID.